Directions: In the applet below, 1) Note the purple inequality displayed in the upper left hand corner. 2) On a separate sheet of paper, solve this linear inequality. 3) Go to the right side of the applet now. 4) Select the appropriate inequality symbol from the list of checkboxes in the upper right hand corner. 5) Enter in the boundary value of your solution set inside the input box (in white) provided. For fractions, use the "/" symbol. 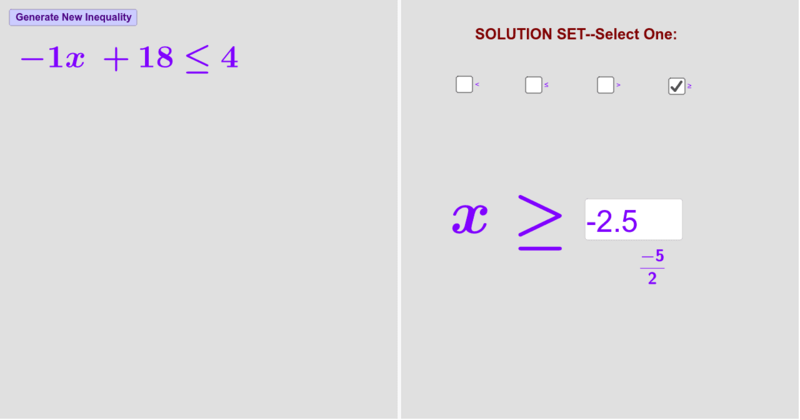 6) If you've entered in the correct solution set on the right side of the screen, a huge "CORRECT!" symbol will appear. 7) If you don't see a "CORRECT" symbol appear, this means you have not yet solved the inequality correctly. 8) Once you've solved the inequality correctly, click the "Generate New Inequality" button in the upper left hand corner. 9) Repeat steps (1) - (7). 10) Repeat steps (1) - (9) as many times as you need in order to master this concept! Mebrak, Sarah. Introduction Geogebra Project.